Affiliations: (1)Department of Psychiatry & Behavioral Neurosciences, Morsani College of Medicine, University of South Florida, Tampa, Florida, United States of America; (2)Center for Aging & Brain Repair, Department of Neurosurgery & Brain Repair, Morsani College of Medicine, University of South Florida, Tampa, Florida, United States of America; (3)Department of Chemistry, College of Arts and Sciences, University of South Florida, Tampa, Florida 33612, United States; (4) Departments of Biomedical Sciences and Pathology, Saitama Medical Center and Saitama Medical University, Kawagoe, Saitama, Japan. Abstract: Lithium is used primarily as a mood stabilizer for bipolar disorder and has been used to treat mania, depression and suicidal thoughts for a long time. In addition, it has also been shown to prevent cognitive decline which indicated that lithium has a potential therapeutic effect in Alzheimer’s disease (AD). However, one of the main problems that exist in the currently FDA-approved lithium pharmaceutics (carbonate and citrate) is that it has narrow therapeutic index and lithium plasma level change drastically which can cause adverse side effects. Here we investigated the safety, pharmacokinetics and therapeutic efficacies of LISPRO (ionic co-crystals of lithium salicylate with organic l-proline), lithium salicylate, Li2CO3 (currently used) and placebo. We found that LISPRO attenuate β-amyloid plaques and phosphorylation of tau through modulation of inflammation and GSK3β inactivation. Cytokine profiles in the brain, plasma and splenocyte suggest that LISPRO (8-weeks) down-regulates pro-inflammatory, up-regulates anti-inflammatory and suppresses renal COX2 expression in Tg2576 mice. Plasma and brain pharmacokinetics of lithium indicated that LISPRO showed significantly higher brain and steady plasma lithium levels on C57BL/6J (2-weeks) and Tg2576 (8-weeks) mice. Interestingly, chronic (20-weeks) administration of LISPRO produces a slightly higher, but non-significant brain to plasma lithium levels and reduces β-amyloid plaques, and tau-phosphorylation through modulation of presynaptic (synaptophysin) and post-synaptic protein (PSD95) expression in 3xTg-AD mice.Summary: Ionic co-crystals of lithium salicylate with organic proline (LISPRO) showed better safety and pharmacokinetic profile of lithium in plasma and brain of wild-type and transgenic Alzheimer mice model compared to lithium salts (lithium carbonate and salicylate). 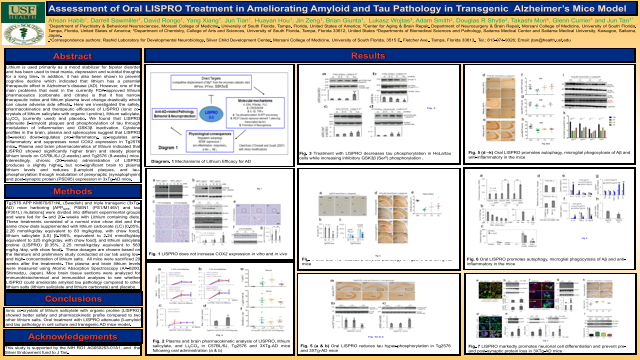 Therapeutic efficacy of oral treatment LISPRO showed attenuated β-amyloid and tau pathology in cell culture and transgenic (2576 and 3xTg)-AD mice model. References: 1. Smith AJ, Kim SH, Duggirala NK, Jin J, Wojtas L, Ehrhart J, Giunta B, Tan J, Zaworotko MJ, Shytle RD (2013) Improving lithium therapeutics by crystal engineering of novel ionic cocrystals. Molecular pharmaceutics 10:4728-4738. 4. Nunes MA, Viel TA, Buck HS (2013) Microdose lithium treatment stabilized cognitive impairment in patients with Alzheimer's disease. Current Alzheimer research 10:104-107.